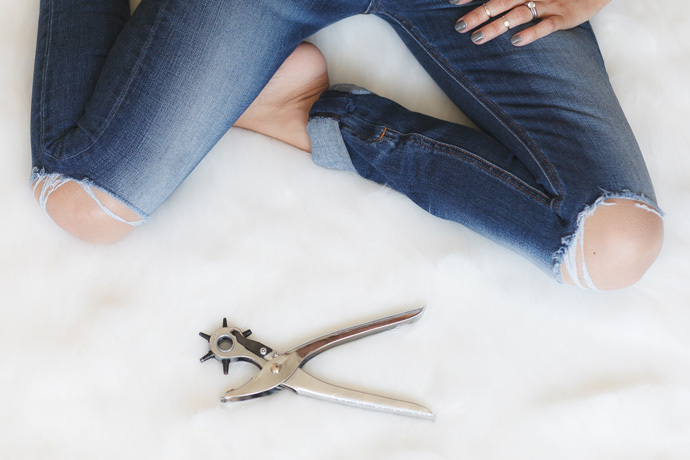 I’d like to introduce you to one of my all time favorite fashion tools…the leather hole puncher! This funny looking tool punches perfectly shaped holes into leather, and can be used to fix a variety of leather related issues. 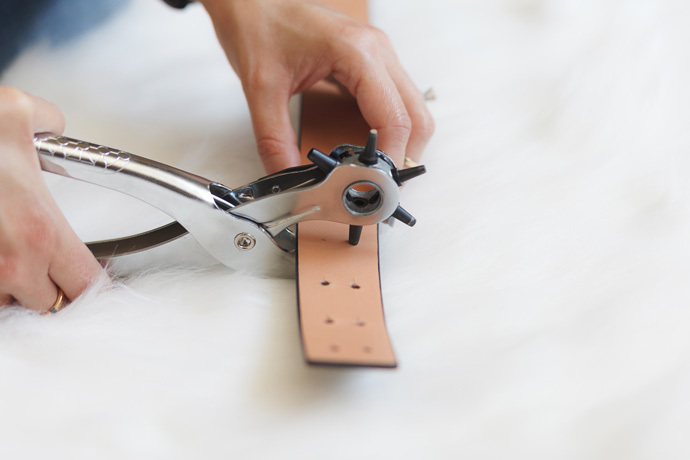 In the past, I’ve used it to add holes to belts that were too large or awkward fitting (one hole is too tight, one is too loose), add a hole to a hip belt that I also wanted to wear on my waist, and add holes to shoe straps that either started out too big, or stretched out with wear. 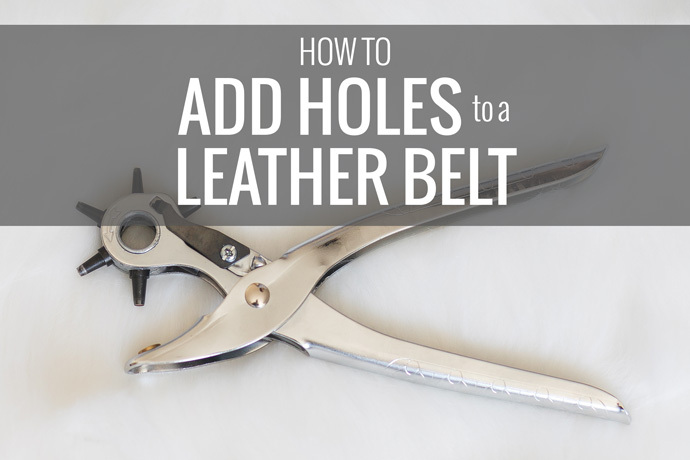 It comes in completely handy, and I’ve even had requests from co-workers to bring it into work so we can have a “hole punching party” where everyone brings in their belts and shoes in need of extra holes. UPDATE: a reader (thanks Linda!) shared another great tool that is better for making those super tiny holes you may need on watch or sandal straps. I bought mine many moons ago, so I’m not sure of the exact make and model, but this one on Amazon looks almost exactly like it, and this one has pretty good reviews. 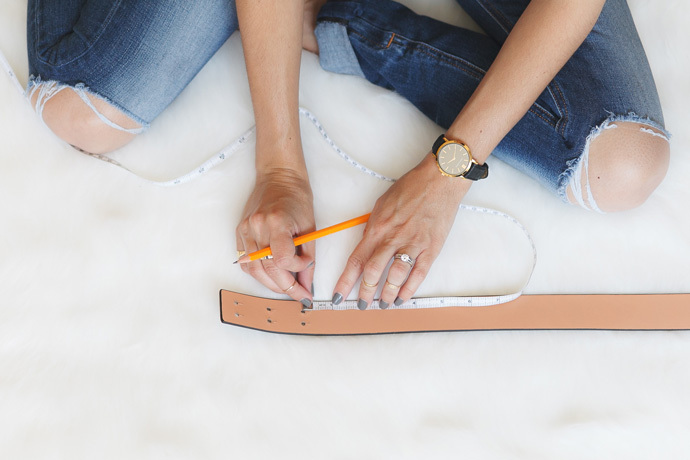 I had a belt that came on a dress that needed just one more set of holes to fit on my waist where I’d like, so let me take this opportunity to show you how to add holes to a leather belt. This belt needs one more set of holes to fit my waist. To make sure the new holes look uniform, measure the distance between the existing holes. Measure and mark this distance where you want to add the new holes. If the belt is wide or double-holed like this one, also measure the distance between the existing holes and the edge so you can make a new hole that looks uniform in that way, also. Holes marked and ready for punching. 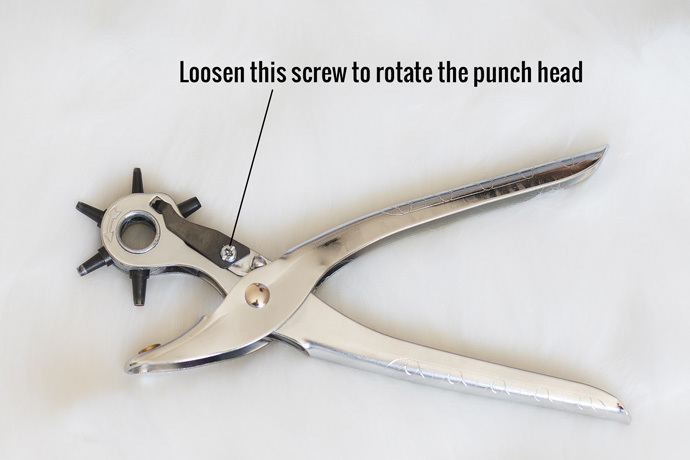 Select the correct hole size by rotating the punch head (loosen the screw on the metal arm, rotate the head to the desired hole size, and re-tighten the screw so it won’t move or slip on you while you punch), and line it up to the markings you made. Squeeze the handle until you feel the puncher go all the way through the leather. I usually have to put a good amount of weight into it. To better match the existing holes and style of this belt, I needed to add a small notch to each hole. I used an x-acto knife to carefully cut the notches. 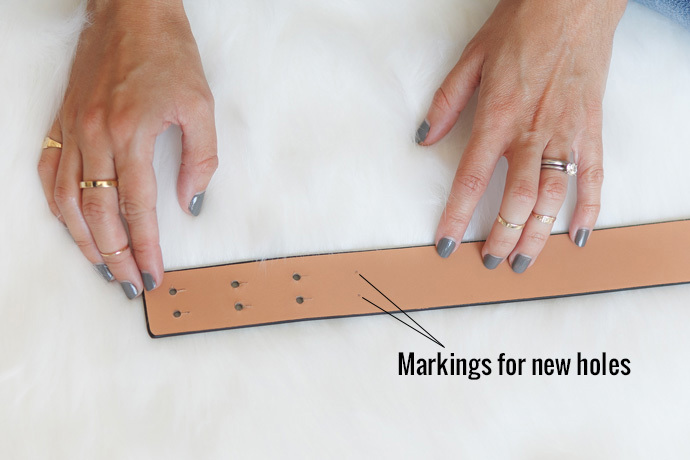 As I mentioned above, you can use this tool on shoes, handbag straps…anything leather that needs some more holes for a better fit. 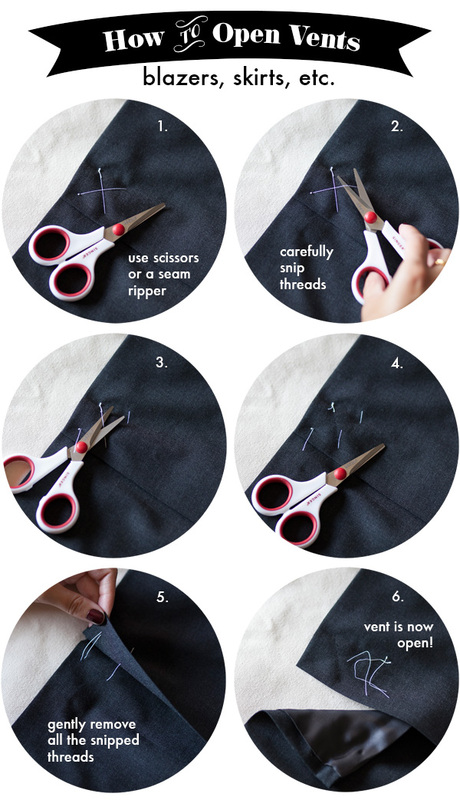 It can also work on faux leather, vinyl and even thick fabrics. Happy punching! Great post Kelly! FYI, I have the same looking leather punch (don’t know the exact brand) and bought it from Michael’s for about $5 after using a 40% off coupon that they commonly distribute. Thanks Amry! I wonder if that’s where I picked this one up…hmm…it’s been so long, I don’t remember! I tried to find it online at Michaels and can’t seem to find it. Did you buy it recently? Kelly, I bought it about 4 years ago. 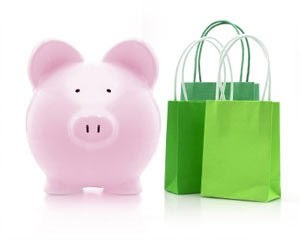 At the time, JoAnn’s Fabric carried them too for about the same price. I remember I had to ask a salesperson to help me find them at both stores. They’re not easy to stumble upon as I’m sure they’re not the most popular item! 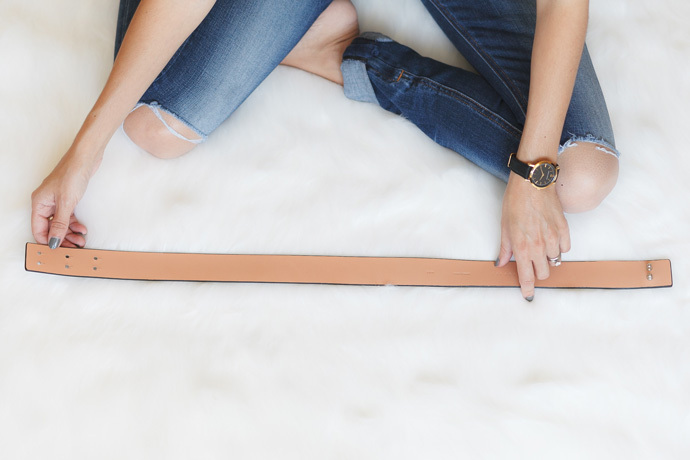 FYI for your readers that may not have a punch: before I purchased my leather punch, my shoe cobbler would adjust my belts for free. It’s so quick and easy that I think other shoe repair shops would do the same.